Would you pay $69 to practically guarantee that every single steak you cook from here on out is done perfectly? Of course you would, and now you can. 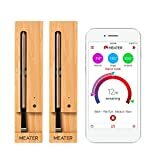 The MEATER True Wireless Smart Meat Thermometer is probably the best thing that’s happened to steak since man discovered how to start a fire. Stick it in your steak (or any other meat) and then toss is on the grill, in the oven, or into a pan just like you normally would. 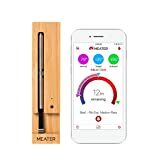 The MEATER connects to a free app on your phone where you dial in your target doneness, and then it lets you know as soon as your meat reaches the perfect target temperature!